Copyeditor General knows what to give you for Christmas (or equivalent). Even though America would probably love Guitar Hero, there are many practical items that the country could really use. Think of them as the grammatical equivalent of tube socks. Business jargon has slithered its way into everyday language. But new and frightening examples are always being spawned, as this business jargon dictionary demonstrates (facipulate, anyone?). 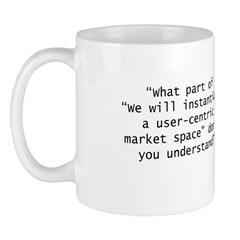 People who use such words to appear smart (it doesn't work) are getting a business jargon protest gift. Because they need a daily reminder that "our alliance stands alone in demonstrating the extensivity of integrated partnerships with other collaboratives" is meaningless. Between Teletubbies and text-messaging, the Kids of Today are surrounded by painful examples of language use. 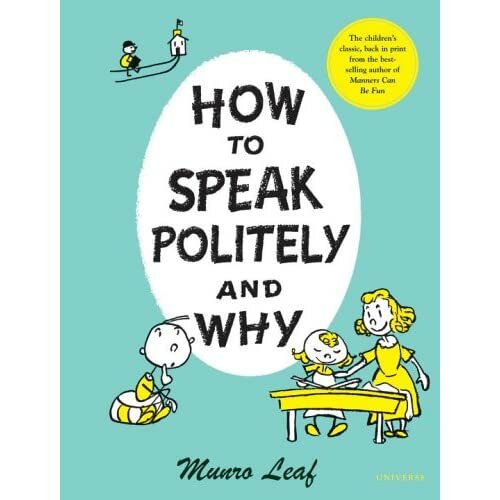 So Santa CG is bringing them How to Speak Politely and Why, the updated version of Munro Leaf's 1934 Grammar Can Be Fun. It isn't just for Lil' William Safire, but for any kidlet who stands a chance of learning to regard "ain't" and "gimme" with disdain. The advice is offered gently and charmingly, and the illustrations are in that great '30s pen-and-ink style. Plus, Leaf was the author of Ferdinand, the story of the bull who preferred to sniff flowers than fight. So getting the kids to enjoy Leaf might lead to world peace. Oh, come on, it's Christmas. I can dream. They snort when TV talking-heads say mediums instead of media. They redline typos on menus. They reply to your email with the victorious observation that (dammit!) you misspelled a wor d ("What, exactly, is proofimg?"). They need something that weaves their derision, precision and Schadenfreude into a soft cotton garment, like this "Urge to Edit" shirt with Arthur Evans's (marked-up) quote: "Nothing, not love, not greed, not passion or hatred, is stronger than a writer's need to change another writer's copy." The Plain English Campaign's mission is to eradicate gobbledygook, jargon and misleading language, especially in content created for the general public (example: a sign at Gatwick Airport that reads "Passenger shoe repatriation area only"). Their A to Z of alternative words (PDF) is a handy reminder that "often" is just as clear as "on numerous occasions," and that "quickly" can replace "with the minimum of delay" with no loss of meaning. It will be printed, bound and dropped down the chimney of every bureaucrat, office manager, consultant and communications professional. Ho ho ho. Copyeditor General's ruling: It turns out you already know what you want for Christmas! According to Ask.com's review of top searches for 2007, the second most common search term this year was "dictionary." I'll leave aside the disturbing news that people are also searching for MySpace and Google (why?) and just say how proud I am that you're making an effort to check spelling and definitions. American Heritages for everyone! It's going to be a happy Christmas after all!